Contact us for more information on current research studies. For more information on the anatomy of the spine and the most commonly treated spine conditions, continue reading below. 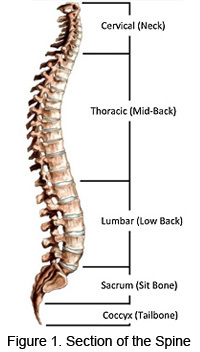 The spine (Figure 1) is comprised of 5 sections, cervical (neck), thoracic (mid-back), lumbar (low-back), sacrum (sit bone), and coccyx (tailbone). 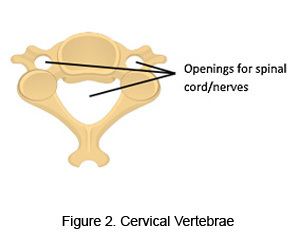 The bones (vertebrae) of the spine contain several openings or holes that allow for the spinal cord and other nerves to pass through (Figure 2). 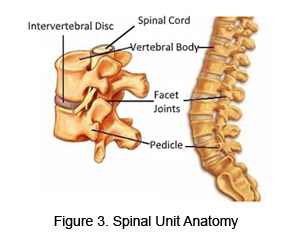 The discs of the spine (Figure 3) are designed to separate and provide cushion between the bones. When diseases of the spine occur, it can cause pain in many other parts of the body, depending on the condition. Select a category below to learn more about specific spine conditions and available clinical research trials. Spine diseases in the neck (cervical spine) commonly cause pain in the head, neck, arms, and/or hands. Cervical stenosis occurs when the openings around the spinal cord or other nerves narrow due to normal wear and tear and/or trauma (injury) to the cervical spine (Figure 4). When the space between the bones of the spine (vertebrae) where nerves exit the spinal cord are reduced; compression of the nerves in the neck may lead to symptoms of pain, muscle weakness, tingling, and/or numbness to the neck, arms, hands and fingers. If you are experiencing similar symptoms in your head, neck, arms, or hands contact us for more information about treatment options. Disc herniation (Figure 5), otherwise known as a bulging or ruptured disc may occur as the result of trauma (injury), as part of the normal breakdown of discs over time, or may be spontaneous in nature. A herniation occurs when disc materials escape out of the disc and place pressure on nerves and/or the spinal cord. Common symptoms of a disc herniation in the neck include numbness, tingling, muscle spasms, weakness and pain in the neck that may travel or radiate downward to the arms, hands, and fingers. These symptoms may be aggravated by certain movements and neck positions. Degenerative disc disease of the cervical spine (neck), refers to the normal wear and tear of the discs that occurs as part of the natural aging process. The discs in your neck are designed to be a cushion between the bones of the spine (vertebrae). These discs are vulnerable to damage, primarily from the natural process of aging. As we age, the water content in the discs lessen and the discs start to slowly deteriorate and breakdown (Figure 5). This deterioration can lead to symptoms of weakness, decreased neck mobility, numbness, tingling and radiation of pain to the arms, hands and fingers. Spine diseases in the low back (lumbar spine) commonly cause pain in the back, buttocks, legs, and/or feet. 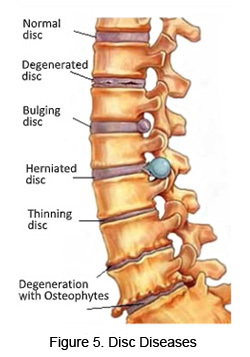 Degenerative disc disease of the lumbar spine (low back) is characterized by the loss or significant reduction of the water content in the discs of the lumbar spine making the discs smaller, more rigid and more vulnerable to damage (Figure 5). This age-related wear and tear can lead to symptoms of low back pain, weakness, numbness and sharp shooting pains to the buttocks, groin, and/or upper thighs (generally pain will not extend past the knees). Pain associated with degenerative disc disease will vary with certain movements and/or body positions (sitting, standing, bending, twisting, etc.). If you are experiencing similar symptoms in your low back, buttocks, legs, or feet contact us for more information about treatment options. The discs that lie between each of the five bones of the lumbar spine (vertebra) are made up of two layers the inner core that is made up of a gel-like substance and a hard outer layer that over time may deteriorate due to aging. A herniated disc in the lumbar spine occurs when the hard outer layer of the disc is torn or damaged which allows the inner portion of the disc to escape or leak out and place pressure on nerves and/or the spinal cord (Figure 5). Common symptoms are pain, leg weakness, a burning sensation and/or numbness of the low back extending to the buttocks, legs, and feet that may worsen with sneezing, coughing and/or bending at the waist. 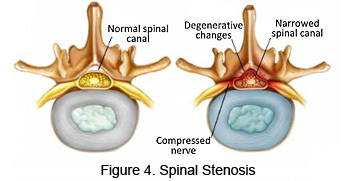 Lumbar stenosis can be characterized as a narrowing of the openings in the bones of the lumbar spine (lower back).The openings in the bones where nerves exit the spinal cord may become restricted (Figure 4) and may lead to symptoms of back pain, leg pain in one or both legs, muscle weakness, tingling, and/or numbness that radiates from the lower back into the buttocks and legs. Leg pain in one or both legs may increase with activity such as prolonged standing and/or walking and will improve when you bend forward or sit. Facet joints are located in the back of the spine and are two “knobs” that line up along the back of the spine and connect two vertebrae (Figure 3). These facet joints allow movement of the back. The surface of these facets joints are covered with cartilage and as pressure or stress is applied from either wear and tear and/or previous injury or trauma the cartilage breaks down and can form bone spurs and cause enlargement of the facet joints. Common symptoms include pain that is worse after rest or sleep and with hyperextension (overarching of the spine backwards), pain in the center of the back that can radiate to the buttocks and/or thighs. The normal curve of the spine (front to back and side to side) is important for proper and pain free function of your back. 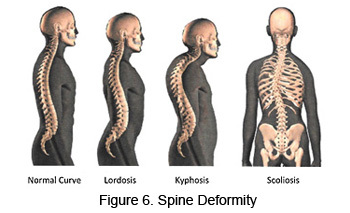 Spine deformity presents as an abnormal side to side curve (scoliosis- Figure 6), an abnormal front to back curve (kyphosis/lordosis-Figure 6), and/or abnormal rotation of the bones in the spine. Spine deformity may exist without pain, unless movement is restricted or the openings for the nerves are reduced. If this occurs, deformity conditions can be painful and affect quality of life for afflicted patients. Contact us for more information about treatment options for these conditions.